The swaybar mount has been TIG welded to the lower control arm and the swaybar link attached. I'm pretty proud of the bumpstop mount and the bumpstop. It looks like a 50s dagmar (bullet). I truly lucked out with the original coil springs. I expected them to be too tall. I planned for a ride height of 11" for the steering geometry and was pretty sure I would have to cut some coils off. The springs gave exactly 11" ride height! I think I'll go and buy some lottery tickets.. 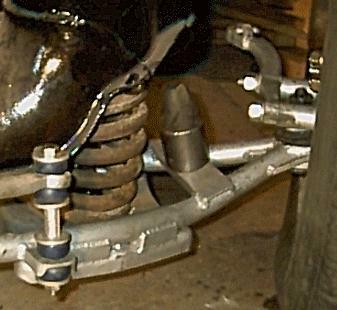 The spring rate calculates out to about 137 lb/inch - for what its worth..
You can see the 73 Ford Courier's steering arms attached to the upright with 1 7/8" spacers to clear the lower balljoint and to give proper steering geometry. It's bolted together with 1/2" grade 8 nuts, lockwashers and bolts. I found that lower grade lockwashers would actually split when used with grade 8 nuts and bolts.